Thank you for your interest in the Belly Fat Blast Challenge beginning shortly! ZONED Fitness has recently teamed up with Prestige Labs to offer our community the best nutritional supplement on the market. 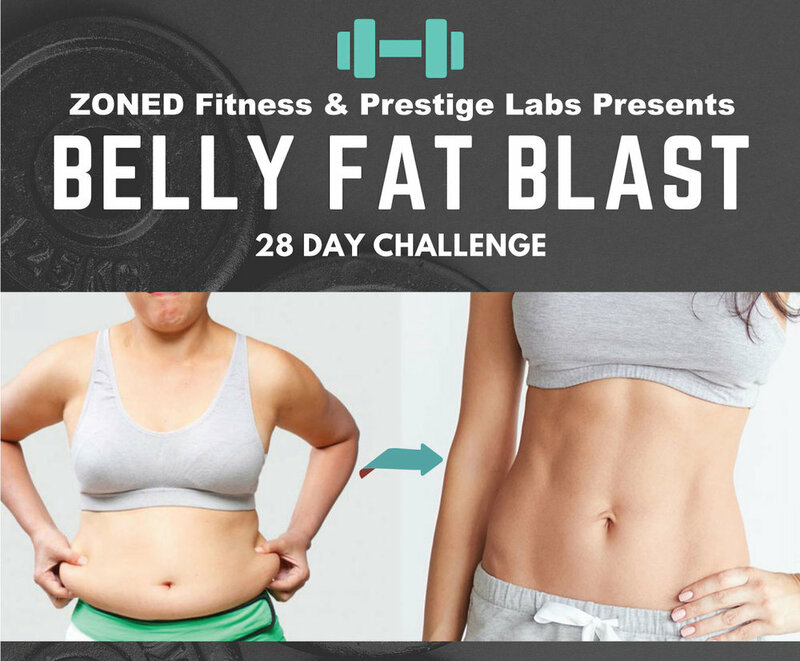 After a lot of work to get to this point, we are celebrating by offering this challenge combining ZONED training with the elite Prestige products to give you AMAZING results!! Their products were formulated by one of the smartest Biochemists in the world, Dr Trevor Kashey. Dr Kashey took his SATs at age 11, graduated high school at age 15, and became the youngest American ever to secure his PhD in Biochemistry at age 19! Until now he only used his formulations for his Olympic Athletes and Pros but with some prodding from some influential people I highly respect he has agreed to release his formulations to the public on 2 conditions. #1 - These can only be distributed by GYMS and Training Facilities (because he believes fit pros should recommend supplementation, not salespeople). #2 - All distributing facilities MUST have specific certifications to be able to fully deliver these supplements. After studying and being tested ZONED Fitness is now certified. How do you plan on participating? Thank you for choosing an enrollment option! Scroll down to learn more about the Prestige Labs products and select a bundle. If you have any questions, please use the form below. If you are joining as a non-member, please return to this page after making a supplement bundle purchase and complete your enrollment at the bottom of this page. Prestige Labs Supplement bundle options for this challenge. If you have any questions, use the contact form at the bottom of this page. Below are the three supplement bundles associated with this challenge. You must purchase one to participate. Click on the image of the bundle you’ll like to purchase. For information on each product within the bundle, scroll to the bottom of this page. Click on an image below to learn more about that product from Dr. Kashey and Prestige Labs CEO Alex Hormozi. Have a question? Please contact ZONED. Thank you for your question! We’ll answer you within a few hours, likely much sooner than that!